Creamy Dill Salmon – The Best Salmon Ever! If you follow me on instragram you saw me post this last week. This is honesty the best salmon I have ever had! I am not a huge fish lover unless its fish and chips or a REALLY good piece of fish and this is really good, I literally almost licked the plate. Don’t judge me. LOL! 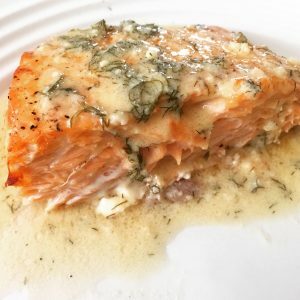 1 Comment on Creamy Dill Salmon – The Best Salmon Ever!